Many fantasy and science fiction artists create images of other worlds and other times. Few can imbue them with the feeling of cultured beauty that Stephen Hickman paints into his work. They are strange worlds, yes, but worlds where the inhabitants have gone to great lengths to beautify parts of their environment. This is an interesting touch and one that infuses Hickman’s images with a simultaneous impression of being foreign and familiar. Palaces gleam in architectural splendor and you can feel the weight and polish of metal, the smoothness of silken robes, even the texture of baby dragon skin. Hickman has been illustrating books by some of the most recognizable names in both contemporary and classic fantasy and science fiction for over 20 years. Of particular interest are a series of paintings for the Pharazar Mythos that evolved from a book that he himself wrote, The Lemurian Stone. I must have been a good boy this year, because Santa brought me a very nice treat indeed: a copy of Little Nemo in Slumberland – So many Splendid Sundays. This is a wonderful collection of 100 examples of one of the most beautiful comics ever created. There are other collections of Little Nemo pages, but the real treat here is that these are presented as they were meant to be seen: at the size of a full Sunday newspaper page! Wow. It’s been 100 years (in October) since Nemo began appearing in Newspapers and almost that long since the pages have been seen at their true size by anyone but collectors. McCay was a virtuoso draughtsman and a superb colorist, and one of the finest masters of the comic art form. He played with time and space, perspective and proportion, color and design in ways that few artists (in any medium) can ever hope to match. 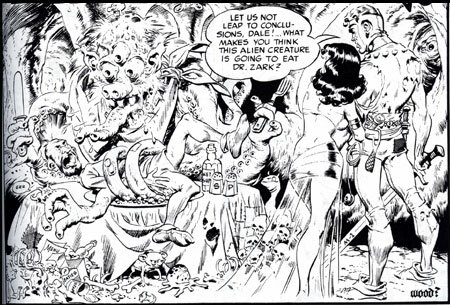 He also did several other comic strips, including Dreams of the Rarebit Fiend and Little Sammy Sneeze, created elegant illustrations and beautifully drawn social commentary cartoons (a bit like extravagant political cartoons, but more general in topic) and was one of the earliest creators of cartoon animation with his groundbreaking film Gertie the Dinosaur, all at the time when comics and movies were just starting to develop. To say McCay was a comic art pioneer is like saying Newton was good at physics. McCay’s Little Nemo in Slumberland and George Harriman’s Krazy Kat are probably the two finest examples of comics as high art. This is such stuff as dreams are made on. Rather than go on for pages and pages I’ll point you to some resources. 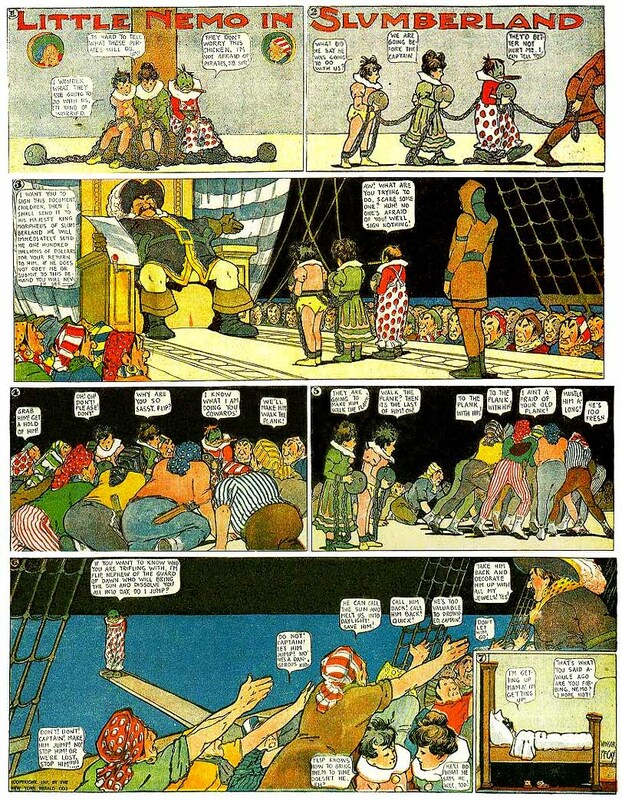 Here is a nicely illustrated Wikipedia article on Little Nemo and on McCay, a Little Nemo article on Toonpedia and an informative review of So Many Splendid Sundays on Salon (requires watching an ad to read the entire article.). The site I link at the bottom of this post has the best reproductions of Nemo pages I’ve found on the web, but here are a few others from my bookmarks. There are three full pages linked from here. (The site’s not in English, but the links are graphic.) There are several linked from here, another page here, and more individual pages posted here and here and here and here. Some smaller ones here and here and some black and white pages here and here. If you’re hooked, but can’t get So Many Splendid Sundays, there are other (smaller but less expensive) Little Nemo collections worth considering. Little Nemo 1905-1914 is nicely done and probably has the most strips in one volume. 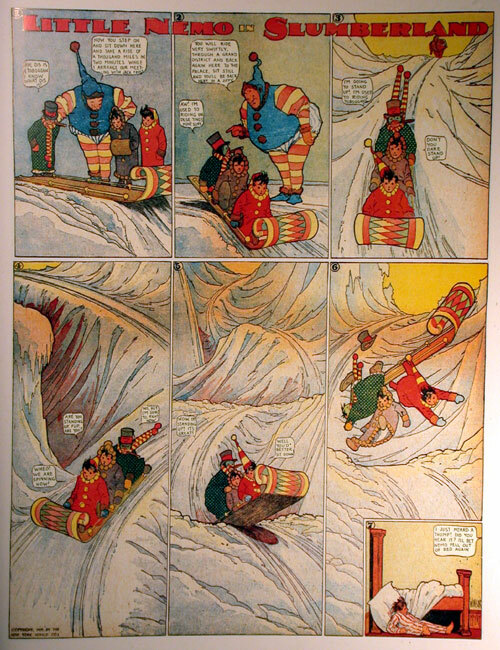 The Complete Little Nemo in Slumberland series (6 volumes) is a bit larger in page size, but the paper is matte and the colors are not as rich as the former title. There is also a new book on Winsor McCay: His Life and Art, and Daydreams and Nightmares, a collection of his other (mostly black and white) illustration. If you do get any of the books, resist the temptation to read through them in a hurry. The best way to read Little Nemo is to savor it one strip at a time. Try reading one a week (OK, one a day), perhaps just before going to bed, or even better, sprawled out on the floor on a Sunday morning; but imagine that there is no radio, no movies, no television, and you have to wait a week in delicious anticipation of the next Splendid Sunday. Designers who blog is a fascinating blog by Catherine (cat) Morley that features, as you might expect, blogs by designers. As she points out, “Due to slop over in the industry, also included are illustrators, photographers, those in advertising and marketing, etc.”, which makes a pretty interesting mix. DWB (or “Dweeb”) featured a post about your humble writer today. (Here’s the archived post for lines and colors.) The blog has a rotating title banner composed of photos of previous featured designers, giving the blogs a personal face they may not always have. (It’s the only time you’ll see a photo of yours truly associated with lines and colors.) There is an archive of the banners. The blogs can be sorted by subject, including illustration. There’s also an extensive blogroll of blogs by designers, many of which are terrific. DWB goes on my “check daily” blog list. Cat also writes a column for Creative Latitude called “Cat’s fancy: Designers who blog” in which she lets a select group of the designers from that month respond to a round of questions about their blog. Robert Liberace’s drawings show his devotion to the study of anatomy and his enthusiasm for Renaisance art. He starts his drawings by creating a middle ground with a watercolor wash. He works the masses of the figure with Conte crayons and the details with terra cotta or charcoal pencils. He pulls the highlights by erasing the watercolor base or adding white chalk. 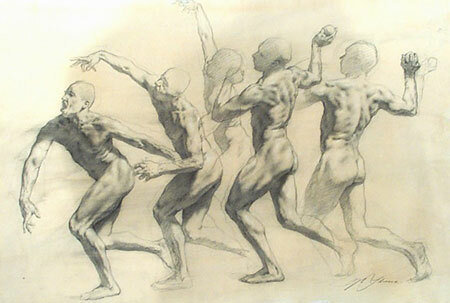 His drawings occasionally show a fascination with progression of the figure through space: multiple studies on one sheet showing the course of motion. Liberace teaches anatomy and advanced figure drawing in Virginia and travels to Florence and Rome to study classical art. Concept artist and illustrator Marc Gabbana has worked on films like Star Wars: The Phantom Menace and Attack of the Clones, Hellboy, 8 Mile, War of the Worlds and The Matrix Reloaded and Matrix Revolutions. He has also done cover illustration for Image Comics and Dark Horse Comics, among others. Gabbana’s paintings utilize intense color relationships and textural detail that make the images “pop”. His work can also display a keen sense of visual humor. He works in acrylic and gouache and sometimes in a type of acrylic called cell vinyl, an animation paint that dries rapidly to a flat finish and allows him to work quickly.